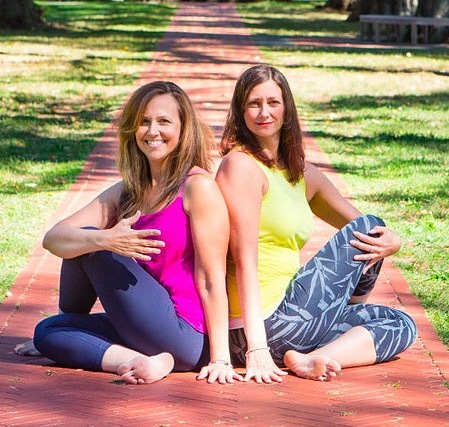 Christina Helms and Sarah Bodnar opened Three Birds Yoga earlier this year in Florham Park. I've done yoga before, and I like it. I can't actually touch my toes without seriously bending my knees and I'm for sure not able to do a handstand. But I love that it's about working with your own body's resistance to achieve strength and that there's a level of thought that goes into each pose. It is yoga, in fact, that helps me understand why some people like golf. It's something that you can always improve upon (one day I'll do that handstand or maybe a golfer will get a hole in one or 18 holes in one) but the journey is also rewarding. With that in mind, I was thrilled to discover that there is a yoga studio in Florham Park. Three Birds Yoga is a lovely space on the second floor of the shopping mall at 177 Columbia Turnpike. The studio was opened in February by yoga teachers (or yogis) Sarah Bodnar and Christina Helms. The name comes from the Bob Marley song, "Three Little Birds," which has the lyric "Every little thing is gonna be alright." The latter is also a yoga teaching and something Helms and Bodnar want to convey. It is light and airy with spaces to relax and a lovely, mirror-free room for yoga. When I was there for a 9:30 weekday class, about 5 students with a wide range of yoga experience took part. Helms led the class, beginning with a charming personal anecdote that illustrated the idea that we exist separately from our thoughts. This is an important concept in yoga in the big picture, and I have heard teachers mention it before. It's also kind of the hardest to wrap your head around, truly, so I really liked the relatable story that she used. We began our practice with a big "om," a sound everyone in class makes together on their exhale. It's one of those things that is easy to make light of but I am always glad when we do it in a class. It is supposed to make the time in yoga class separate from the rest of your day, and some things are cliche because they work. At the end I felt de-stressed, and my muscles had worked hard too. That's a pretty winning combination in my book. Three birds offers beginner and open level classes daily. They also have series like for kids yoga and for beginners, for which you can purchase multiple classes in advance, and workshops for things like back-bending and their sold-out mother daughter writing and yoga workshop this Sunday. Find out more at threebirdsyogastudio.com.